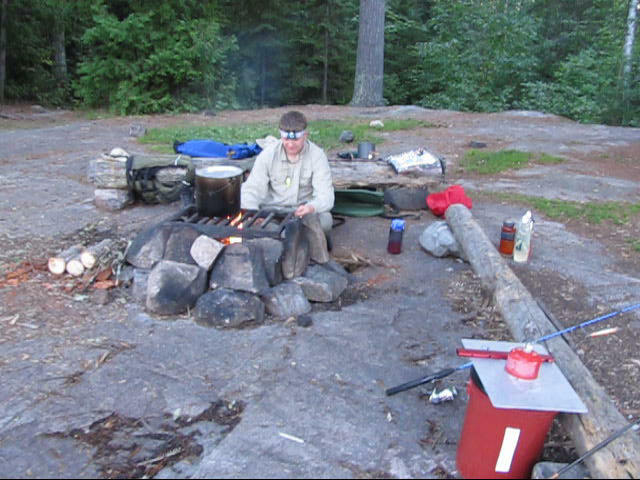 Follow are the adventures of Ethan & Kevin on their canoe trip to the Boundary Waters Canoe Area in August 2010. 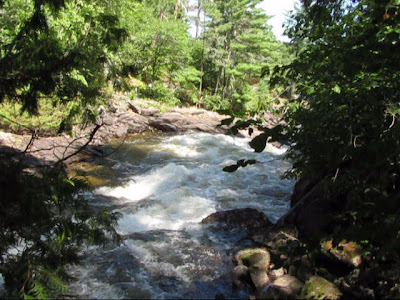 This trip started at Fall Lake (Entry Point # 24) and ended at Moose River (Entry Point #16) This is a trip that I originally took back in 1978 with my Scout Master Jim, and two friends Jon and Martin. We left Hanlontown, IA at 5 am and headed north, and hit the Minnesota State Line at 5:18 am. Continuing north near Wyoming, MN, at about mile marker 138 on I 35 East we noticed a state patrolman with his lights flashing in the south bound lane. Someone had hit a large black bear. Our first bear and we were only 150 miles from home. We went through Duluth and towards Two Harbors to see some of Lake Superior. There was a lot of road construction in and around Duluth. We pulled into Ely, MN at 11:30 am. Only six and a half hours. We did a quick drive around town and went out to check out Fall Lake Camp ground. Saw our spot was reserved, but could not check in until after 3 pm. Went back into Ely and went to the International Wolf Center and did a walk through of the exhibits. All of a sudden we heard the wolves start howling and went to check it out. We had at least three wolves gave us a good show. After we left the wolf center we headed back to Piragis Outfitters to check in and settle up on our outstanding balance. We watched the BWCA Leave No Trace video and picked up our entry permit. A quick trip to the Subway for a sandwich and we were back out to Fall Lake Campground to set up our first camp. Latter on it was back into Ely once more for a little Italian supper, and then to Zup’s grocery to get Ethan some rolls for breakfast. Did a little fishing from around the shore of our camp site with no luck. Pretty sun set this night. We got up at 5:30 am and broke camp. We were to be at Piragis Outfitters between 6:15 – 6:30am. Got into town, unloaded our gear, and parked the truck. A quick fitting of our life jackets and got our paddles. They were 15.5oz carbon / kevlar Wenonah bent shaft paddles. We also rented two Crazy Creek canoe chairs. Our canoe was a Wenonah Minnesota II Kevlar canoe weighing in at 42 pounds. We were off. Back out to the Fall Lake boat landing area with gear loaded we were off at 7:15 am. We headed towards our first portage, 80 rods around Newton Falls. 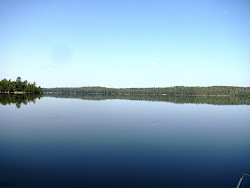 From here we were on Newton Lake, head towards Pipestone Falls. This two was another 80 rod portage. We made our way through Pipestone Bay and the water was too low to make it through into Jackfish Bay so we had another 87 rod portage. 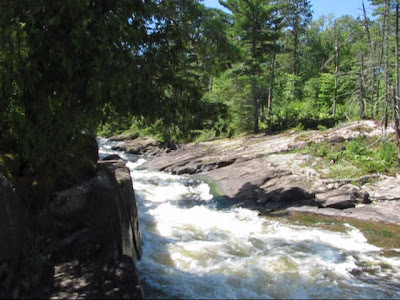 This portage was our first “real” portage as the first two you can use wheels on your watercraft for transport. We decided to have our lunch before we started the portage. Bear is located just above water line in about 1/3 of picture from right. As I sit here at home with it all zoomed in, I'm not so sure as it may also have the "mom" just above the cub. The cub was close to the water and has some tree branches covering part of him, but it looks like a bigger head above it. With the wind at our back we made great time across the big lakes today. We stopped for the night at Camp Site # 1539 at about 2:30pm. 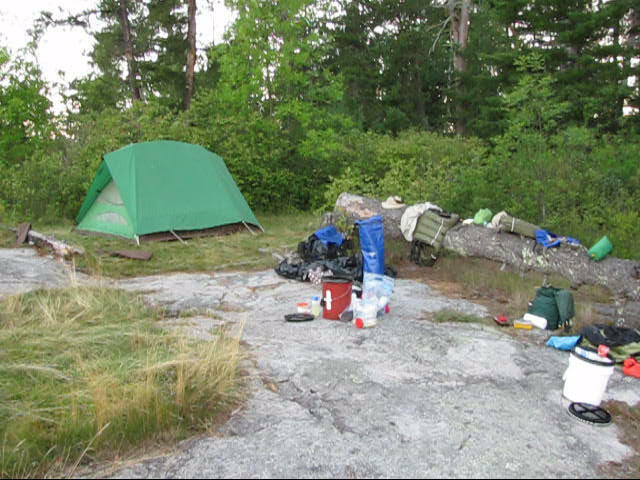 The last campsite before the 340 rod Horse Portage. I received a little wake up call while out getting firewood, as I got stung on the cheek, and on the left hand on my “”California Howdy Finger”. My cheek did not feel too bad the next day, but my finger it was right on my last knuckle and it was several days before the pain stopped. We had rib eye steaks and corn for supper. Ethan did a little fishing from the bank and caught a smallie. We traveled a total of 14.46 miles today. I got up at 6am and started my coffee, and our breakfast. We had camp broke and on the way about 8:15am. Short paddle to “Horse Portage”, a killer at 340 rods, just over a mile. 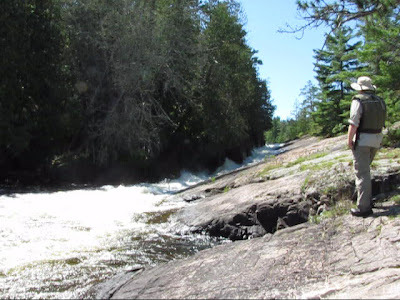 It was 10 am by the time we got everything to the far end of the portage. Fifteen minutes after we got back at it, it was time for another 30 rod portage. Another portage today was around Wheelbarrow and we stopped for lunch. 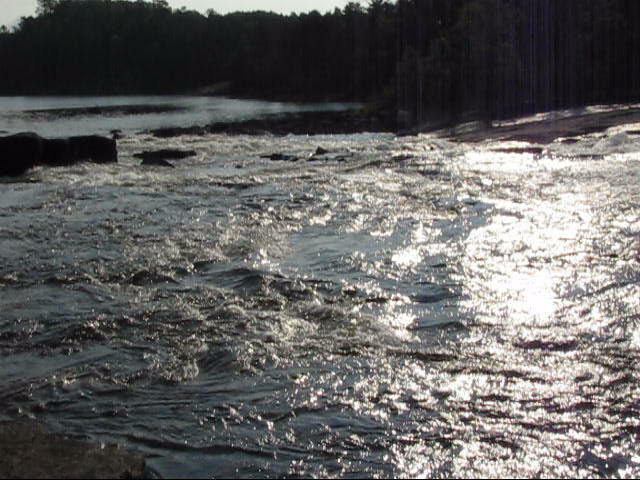 Our last portage (12 rods) of the day was in Canada around Lower Basswood Falls. Following Lower Basswood Falls, we encounter our first Indian Pictographs of our trip. Ethan picked up a little hitch hiker for awhile today. Stopped just down the river from the pictographs as it had been a long day. We stayed at camp site #1866. Went out fishing and Ethan caught a few northern. I had several bites, but they all came off right at the canoe. I was up today at 6:15 and had breakfast ready for Ethan at 7 am. Broke camp and hit the water at 8:10 am. Today we stopped for pictures at Table Rock. This is where the Voyageurs would stop to do repairs on their boats, and take breaks. By the time we stopped for lunch today we had white caps on the water. Not much fun going across Thursday Bay. Today we did stop at a camp site for our lunch and it looked like a very nice camp site, with a great boat landing (Camp Site # 1853). Ethan had a couple friends that played with him while we ate. Winds finally letting up a little to the point I can get the camera out. Coming across Thursday Bay was more than a little rough. We had a tired Voyageur when we hit camp today. We stayed at Camp Site #1871, an excellent camp site on an island. I made pizza in my new GSI 10" Hard Anodized Aluminum Dutch Oven tonight. It weighs in at 3.10 pounds and it did a great job. Ethan got some more fishing in while I cooked supper. The sunset tonight. Just heard a wolf howling in the distance. Today we did see a beaver and an otter. Total Miles today 9.32 with very strong winds, but no portages today. I was up at 5 this morning and we had breakfast done and ready to hit the water at 6:45 am. Ethan found a GIANT Leach this morning. Bet that it was over 8 inches long stretched out. He kept it for bait (wish we had several dozen more). We were on the water this morning at 6:45.It was a beautiful morning to be moving across the water. 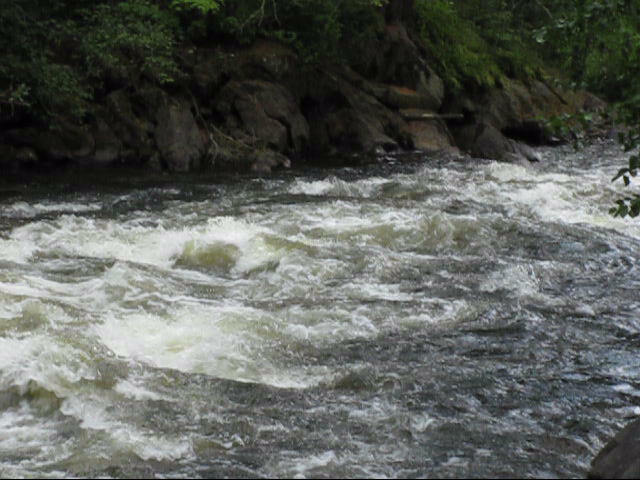 We had lunch today after the Curtain Falls portage (139 rods). 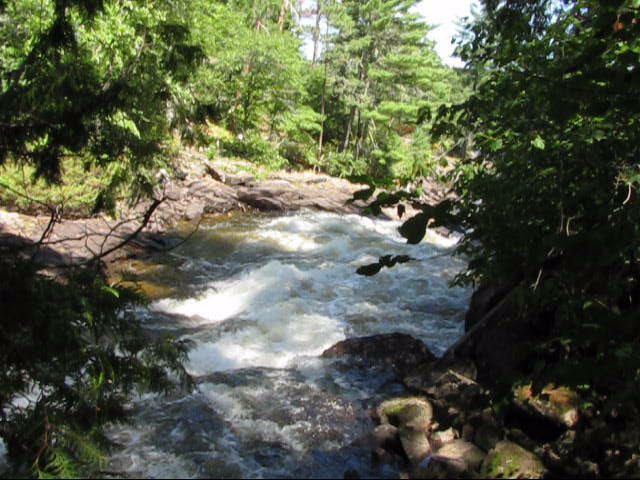 Bert at Piragis said that we should go check out Rebeca Falls in Ontario since we would be so close to it. It was some of the most beautiful water that we would encounter (48 º14.7751’, W091 º55.9452’). There are two sides to this waterfall. If you are to portage it, I would take the south route as the north side we had to jump to make it around. Water was pouring out here in a circle the size of a basketball. After we left Rebeca Falls we headed towards Bottle Lake for probably the hardest portage of the entire trip. This was an eighty rod at Bottle Portage. It was a swamp / bog getting out, and the portage was a mud hole the entire way. It was about 2:30 when we got done with the portage, time to look for a campsite. This was not to be our day as it took us until 6 pm to find a camp site. Everywhere we look, they were full. It was over eleven hours since we had left our previous camp in the morning. 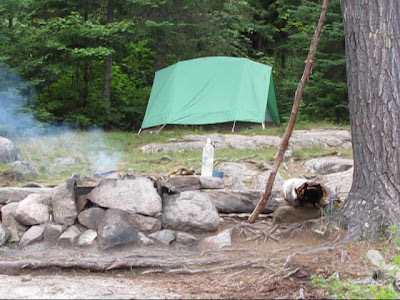 We had to go all the way up to Camp Site # 169, straight across from the pictographs on Lac La Croix. 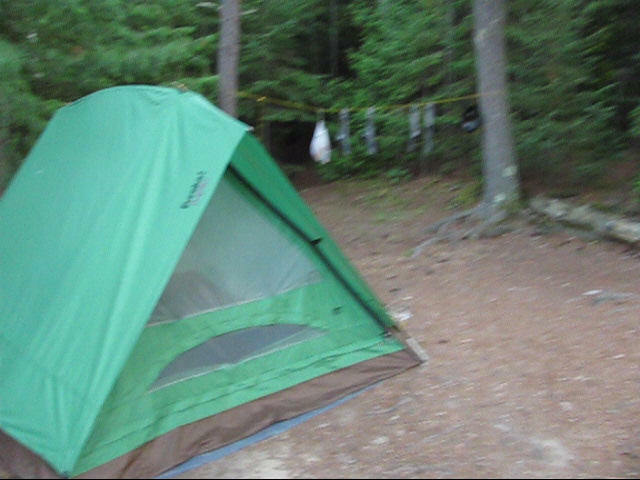 Not a very good campsite at all, but it’s all that we could get. Bees’ were swarming, but didn’t bother us except for the sound. We were too tired to care about them.